Baltkran will deliver four cranes for two units of Rooppur NPP. The order, the largest one for the last three years, was placed at the end of 2018. Baltkran will again deliver a container crane for a large transhipment hub on the river Volga. Baltkran won a public auction for delivery of 6 overhead cranes for Yantar factory a part of OSK company. According to forecasts of Baltkran management volume of product sales of the company will increase by 28% in 2017 and the order book will increase by 50% year-on-year. Baltkran shipped the second overhead crane for Indian nuclear power plant Kudankulam. It has been the second crane capacity 360 for Nuclear Power Corporation of India Ltd (NPCIL) this year. A leading Russian manufacturer received an order for double girder wide span container gantry crane for the Belarusian Railways. BALTKRAN has won an international tender, held by a leading logistic German company for delivery of four rail mounted container cranes. BALTKRAN started shipping an overhead crane capacity 125/20 tonn for a large Russian iron and steel company. BALTKRAN received another order for a container crane for the Far East, this last order will increase a number of container cranes at the Fare East to 25 units. The production of a gantry crane capacity 50 t has started. The crane will handle the Kerch strait bridge elements and sections. BALTKRAN again proved its competence in sphere of material handling equipment according to EU standards. A double cantilever container crane capacity 41 t under spreader has been commissioned according to the schedule on the intermodal terminal in Lithuania. BALTKRAN got an order for delivery of another container crane in 2016 for large operator Sayan. BALTKRAN will deliver a widespan gantry crane for an actively developing enterprise in Orenburg region. BALTKRAN will deliver lifting equipment for the largest mine in Russia part of Severstal holding. Baltkran got the new order for the gantry crane construction to St. Petersburg. Baltkran has won a tender for supply of a widespan double jib gantry crane to Samara. Delivery of 2 new portal cranes for a long-standing customer � a large oil producing company will continue a 30-year history of Baltkran's deliveries of lifting equipment for Siberia. The cranes with capacity 15 t and boom length 30 m will operate at logistics complexes in the Khanty-Mansiysk Autonomous Region. One of the cranes will be installed in the bay of metal depot built for receiving, storing and distribution of metal to workshop of reinforcement units. Intermodal terminal in Arkhangelsk is increasing its throughput. A new container crane of Baltkran will help to achieve this aim. The crane will be delivered and commissioned by Baltkran technical team before the end of this year. Baltkran is to deliver a portal crane to Buzuluk, Orengburg region. The crane is designed for handling of metal plates and pipes in the material supplies storage area. Crane capacity is 12,5 t, boom reach is 30m. Other two wide-span gantries capacity 25 and 12,5 t, bridge length 40 m, hoisting height 10 m will be produced for a logistics centers of large Russian company in Orenburg region. Capacity of the crane is 41 t, span is 25 m, hoisting height is 2+1, and stacks will be located between crane legs. Volumes of investments in handling equipment at the moment determine flows of bulk and container cargoes, which will increase high rate according to forecasts. Equipment is bought specially for them. A new double cantilever double girder container crane will handle about 60 thousand TEUs annually and will be used for fast growing container trade. The crane spans trucks lanes, staking and railway lines. Baltkran will deliver a double girder container crane for an intermodal terminal in Chelyabinsk. This new container crane equipped with a telescopic slewing spreader will handle about 50 thousand TEU a year. A container crane of Baltkran will ensure reliable handling of containers on intermodal terminal in Artem, Primorsky Krai. One more terminal of RFE is expanding its capacity for handling of high-capacity containers. Baltkran received an order for production of a wide-span girder gantry crane capacity 50 t with total bridge length 60 m for Sibmost company. The crane will operate on the site for assembly of large bridge structures, making assembly and launching of steel structures. Baltkran continues to implement modernization, expansion of production facilities and reequipment of workshops. New equipment for mechanical treatment of components and units as well as for blasting of plate, pipes and sections surfaces was put into operation in 2011. A tender for supply of lifting equipment was hold at the end of 2010 at Lukoil. Baltkran is again to produce a portal crane and several gantry cranes for four material supply storage areas of different oil-producing subsidiaries of l Lukoil group in Western Siberia (in the Perm region and Republic of Komi) in 2011. Baltkran received an order for12 sophisticated cranes for heavy handling and assembly of important facilities for Novovoronezh NPP-2. Baltkran has previously manufactured four overhead cranes with total capacity more than 1000 t for a turbine island, a trestle crane and four gantry cranes with total capacity more than 150 tons for logistic warehouses. Baltkran technicians are to complete assembly of a double-girder gantry crane for a large intermodal container terminal near Saratov city. Crane capacity is 35 t under spreader. The crane is equipped with a telescopic spreader for handling containers 20� , 30� and 40�. Frequency control drives of the crane assure smooth travel, safety and energy saving when moving, lifting or lowering. Holland Company processing coffee and cacao beans (Amsterdam) has ordered from crane building Russian-based Company Baltkran STS quay container crane for handling 20, 40, 45 and 48 ft containers. Baltkran, Kaliningrad based crane building enterprise made unique operation on loading of three high-production container cranes RMG (350 t. each) on board of a special vessel for delivery to Saint-Petersburg. 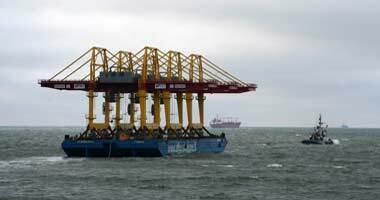 Cranes for handling of 20, 30, 40 and 45 ft containers were produced for the biggest in Russia container terminal - First Container Terminal, Saint-Petersburg. Baltkran's own know-how were used on the cranes meeting the latest international requirements. 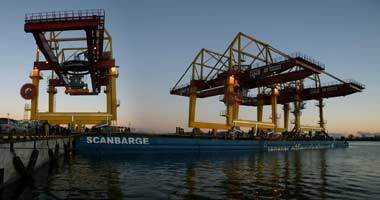 The cranes are delivered to the terminal by sea fully erected and ready for operation. Company ordering the crane is the first logistic provider of the Volga region. It was introduced in 2004 in the town of Kinel, Samara region. OAO Srednevolzhsky Logistic Company has several terminals A and B and intermodal container terminal, where a new gantry container crane will be erected for high-capacity containers handling. Kaliningrad joint-stock company Baltkran was entrusted with manufacturing of this crane. Diamonds excavation was started in Yakutija more then 50 years ago. Since then in the region there has been a growing demand for mining lifting equipment, vehicles, fuel and building materials supplies. The river Lena became the major way of delivering the above-mentioned and other cargos. Therefore there is an intensively ongoing construction of industrial objects, cities, roads and hydroelectric power stations on its banks. In July 2006 Kaliningrad joint-stock company Baltkran - manufacturer of the complex lifting equipment - was officially accepted as a member of the international Port Equipment Manufactures Association PEMA.